A few weeks ago Austin’s mom ran into an old friend. This friend in particular happened to be spending his time these days as a guide on the San Juan River. Shortly after their meeting a commercial trip he was scheduled to work fell through. This family friend then had the idea to use the permit still reserved for the cancelled trip for him and a few friends. Having just recently reunited with my boyfriend’s mother, he decided to invite her and her husband along. They invited Austin and me. That is how this trip came to fruition. Usually you need to submit an application for a permit to float the San Juan months in advance, and from there a lottery system is in place to determine who gets the actual spots. Austin and I had looked at getting a permit for a trip this summer, but missed the deadline to submit an application. So imagine our good luck when this trip fell right in our laps! We were thrilled. We awoke early Tuesday morning to make the drive from Mancos to Bluff. 3 hours later we arrived at Wild River Adventures, the concessionaire our new friend Don worked for. His boss had kindly allowed us use of all the equipment we needed, so we loaded our things into dry bags and headed for the river. Don thought this would be a good opportunity for a guide-in-training to have a chance at the oars for an entire trip, so in addition to him and our party of 4, we had the company of the trainee and his visiting friend. They had our two oar rafts and a ducky (basically an inflatable kayak) ready to go by the time we arrived at the put-in location. Austin and I grabbed the ducky for the first bit, while the ‘grown-ups’ took one oar raft and the trainee and his friend another. Although there are rapids on the San Juan, the river was running very low, and so there weren’t any huge challenges in our path. Our biggest problem was getting stuck on rocks that would have otherwise been submerged! That wasn’t an issue for Austin and I in our ducky though, as our little boat was much lighter than the large rafts and navigated the river easily. Our first stop was lunch at a place called Butler Wash. 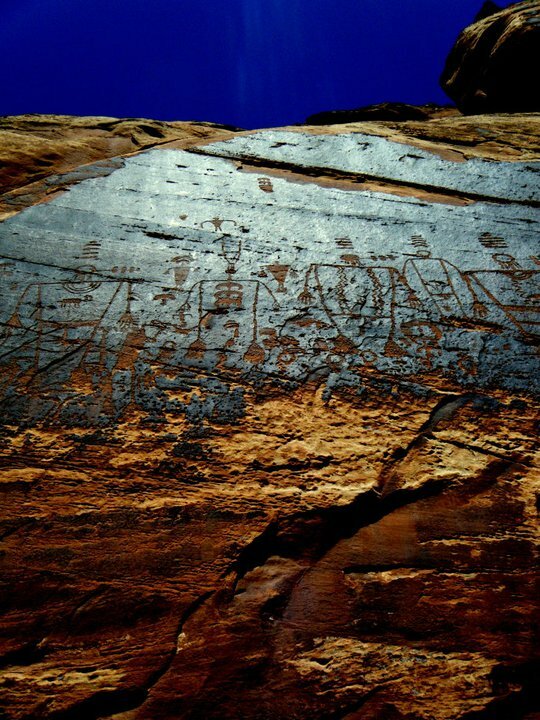 Besides being a perfect shady spot to take shelter from the sun (I was hard at work getting rid of a pretty offensive farmer’s tan), it is also home to an INCREDIBLE panel of petroglyphs. We ate our sandwiches enjoying the view from afar, then hiked up the talus slope to get a closer look. It wasn’t long before two other groups had invaded our spot though, so in a bid to beat the crowds we loaded up and headed out. Happily, we didn’t run into another party the entire trip. 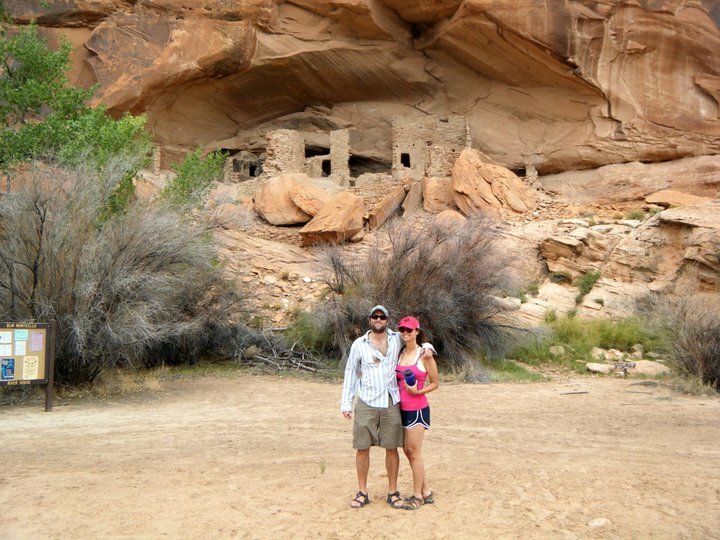 Our second stop was a short hike up to a cliff dwelling called River House. Don apologized profusely to me for the hike, as he assumed my work being what it was that I would loathe spending my days off in proximity to any more archeological sites. Maybe I haven’t been at it long enough, but that couldn’t be farther from the truth. If anything, the knowledge I’ve gained in the past few months at Mesa Verde has only made exploring other sites more fascinating. It’s like I now have a pair of special glasses that allows me to see things no one else can and interpret meanings beyond the obvious. It almost feels like a superpower. I love it. I think I always will. River House was beautiful. It was immaculately preserved, with only a little bit of obvious stabilization completed. And probably my favorite thing about it – it was pink! Well, more or less. What can I say? Just because I can identify where the clay in the mortar came from or explain to you the purpose of each room in the site at a glance, doesn’t mean I don’t still appreciate my old favorite frivolities. A and I in front of River House, looking disappointly less pink than I remember! After River House Austin and I decided to trade our ducky for a lazy seat on the oar raft (it was my weekend after all, can’t work too hard!). And good thing we did! As we pulled off from shore a dark cloud rolled in and brought with it a strong up-stream wind. This turned our leisurely river trip into an agonizingly slow fight down-stream. Although this meant we didn’t get to our camp until much later than anticipated, it also allowed us time to consider some of the most beautiful sections of the river. 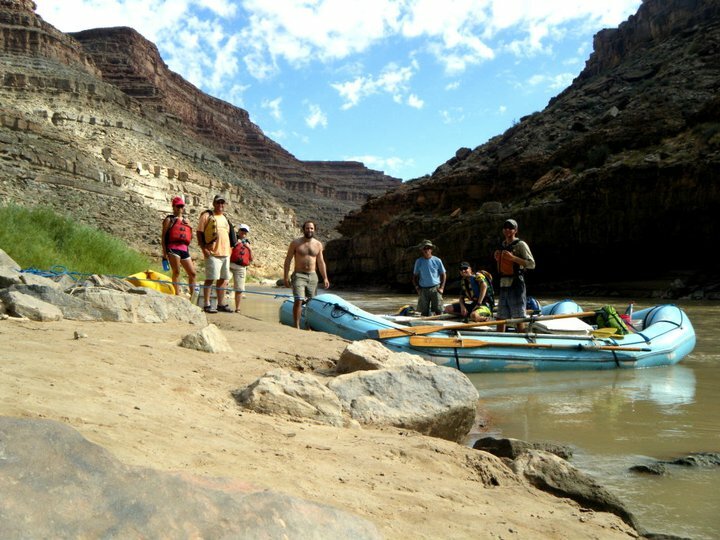 Shortly after River House the banks of the San Juan change from lazy, sloping beaches to sheer canyon walls. 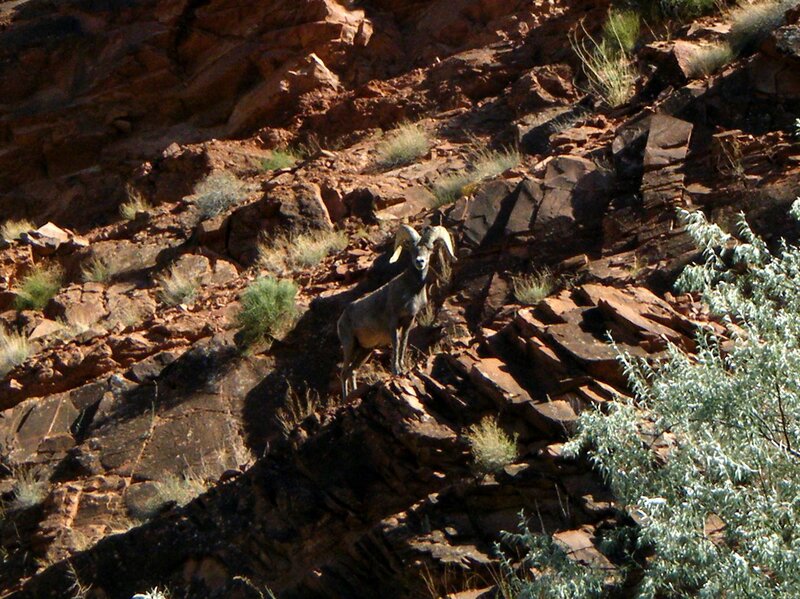 As if the change weren’t dramatic enough, right at the entrance to the canyon stood a large adult bighorn sheep. He stared at us as we passed, as if welcoming us to his territory. In fact, he stood opposite the fence the Navajo Nation had installed to keep him in. His defiance was enthralling. We saw 9 more sheep during the course of our trip. In all my time at both Canyonlands and Mesa Verde, I had never seen one. So this was AWESOME. We pulled into camp late but happy, but I had a full bladder, and since the wind had been blowing hard and chilling, jumping into the river was not an exciting option for me. The rule for waste management on the river though is that all, ehem, ‘number 1’ must go into the water. So I set off to find a rock down from camp I could squat behind to get the job done. The mud was sticky and had caught me several times already. So I made my way gingerly, testing each step before putting weight on it. Apparently this was not sufficient though, because it wasn’t very far out that my leg fell almost half its length with one step into some very unkind quicksand. I immediately set to jerk it out, but that’s not exactly how quicksand works, and it only brought me deeper. A moment of panic set in as I felt the mud suction around my shoe. I knew that if I slipped my foot out of it I could escape easily, as it was holding on to the heaviest part of me. But the heaviest part of me today was a pair of brand new Keens, and I had no plans of giving them up. This wasn’t the first time I had been caught in quicksand. In fact, it had happened twice already earlier that day. But this was the farthest I had been in it. I attempted a pointed toe as best I could to move the weight to a more concentrated spot. This had worked fine when I was ankle-deep, but with almost my entire calf under-ground I didn’t have the strength to push the movement. I called to Austin for help. He responded quickly with a grin and a camera. After the required photo, he acted as a brace and balance beam to enable my escape. Luckily, it worked. And to my delight, a bucket was brought for my use. No more searching for rocks. That night we feasted on chicken and brats. But the wind had not calmed down, and we were all sitting with squinted eyes and sandy mouths. As beautiful as our campsite was, that freaking wind was really putting a damper on the evening, and my original intent to sleep under the stars started to seem less and less practical. 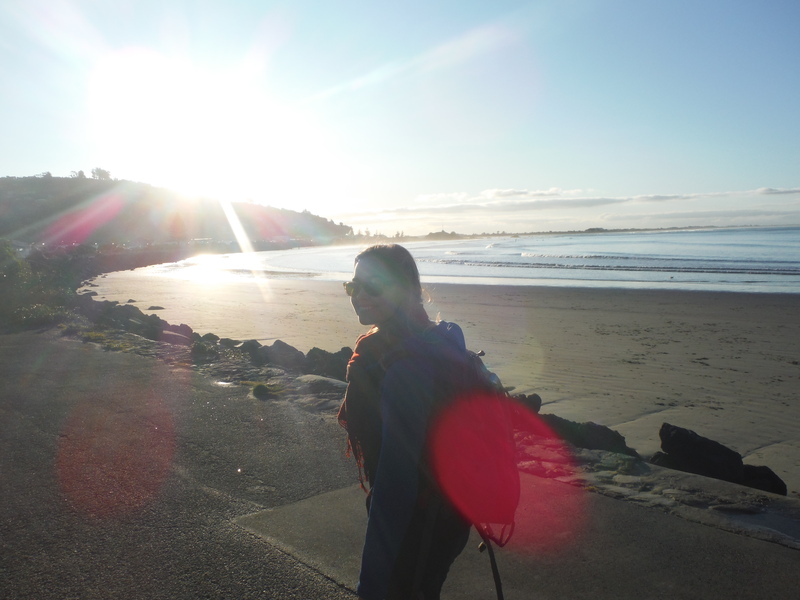 When the sun had gone down and the wind was still blowing, I made up my mind. Sleeping on a wind-blown beach sans protection was too painful an option. I set up my little tent. Austin’s parents followed suit. The rest were planning on sleeping on the boats, where they would be safe from the sand. Just as bedtime rolled around the wind finally died down. But since the tent was set up, I decided to take advantage of it anyway. I love my little tent. It’s a 2-person backpacker’s tent from Mountain Hardware I purchased last summer in Moab. We’ve gone great places together. As wonderful as the great outdoors are, there’s something comforting about retiring to a familiar setting at the end of the night. It’s like taking my bedroom with me wherever I go. The view changes, but the familiarity is there. It’s nice. Boy was I glad for that decision. Upon waking up the next morning, dozens upon dozens of tracks covered the beach. The mice had taken advantage of the mess the wind had made of our dinners, and once we were packed, the only portion of sand not covered in mice tracks were the places our tents had laid. At least our clean up was easier. We feasted on an amazing dutch oven breakfast casserole and loaded the boats. We had two (somewhat) major rapids to navigate that day, though with the water as low as it was neither were very treacherous at all. Still, our boatman in training manning the other oar raft wanted to scout the first one, so we pulled the boats to shore and scrambled up a ledge to get a better view of the rapid. I love scrambling. For some reason using all of your extremities to hike is way more fun than just your legs. We made it through both rapids uneventfully and continued our lazy float down the river. Twice during the day I decided to get out and float myself. But it was much easier said than done as the water was so shallow the only way to keep yourself afloat without running aground was to keep your feet high in front of you. Being an experienced water girl this was not a problem for me, but poor Austin almost gave up a kidney trying to make it work. To be fair my behind also brushed the top of a few rocks. But it was worth it. 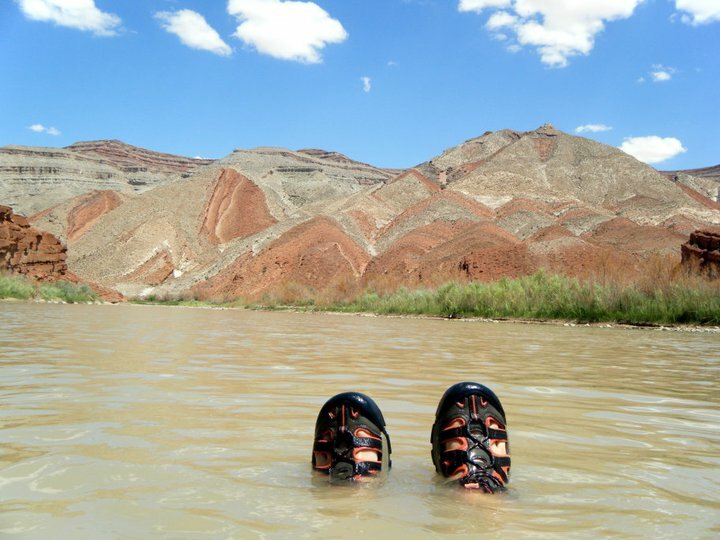 Nice current, cool water, my feet, and the Mexican Hat Syncline. Just another reason my life is awesome. Finally we were greeted by the famed Mexican hat rock formation for which Mexican Hat, Utah was named after. Because the water was running so slow it still took almost another hour to reach the take-out point. Unpacking took much longer than packing had, probably because we were all so reluctant to go. It was an amazing, beautiful, relaxing weekend. 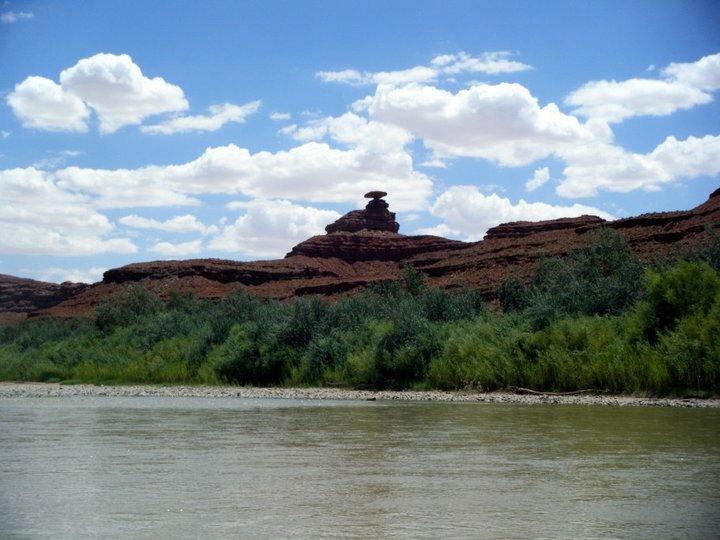 We are already making plans to complete the second half of the San Juan (Mexican Hat to Clay Hills – a 3-4 day trip) next summer. Ah my beautiful San Juan, we will meet again. And maybe someday soon I will be able to get your sand out of my ears. My favorite picture is the one of your sandals framing the syncline.